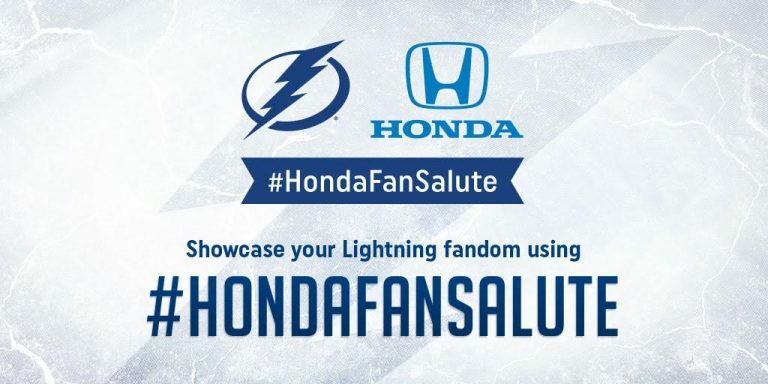 Win Tampa Bay Lighting Tickets with the Honda Fan Salute! Honda is a huge supporter of the NHL, and recently announced that it will serve as the title sponsor of the 2017 NHL® All-Star Game in Los Angeles. Wayne Gretzky, NHL icon and all-time leader in goals, assists and points, unveiled the partnership with a custom-wrapped 2017 Honda NHL® All-Star Ridgeline. The all new 2017 Ridgeline will be presented to the player chosen as MVP of the All-Star Game, which takes place on Sunday, Jan 29 at the Staples Center in Downtown Los Angeles. 2017 is a special year for the NHL, marking the league’s centennial. This marks Honda’s ninth year as the Official Vehicle of the National Hockey League. In Tampa Bay, we are fortunate to have one of the best hocky teams in our backyard– The Tampa Bay Lightning. Honda is running a special promotion in our region called the #HondaFanSalute that gives fans the chance to win a two-year lease on a 2017 Honda Accord LX Sedan! All you have to do is share a hocky themed photo and tag it with #HondaFanSalute #WildeHonda and you will be entered for your chance to win. Read the full rules and regulations here. There will be five monthly finalists and 1 grand prize winner. Each monthly winner wins one regular-season pre-game VIP experience that is inclusive of a guided tour of Amalie Arena and the Tampa Bay Lightning locker room; and attendance at a Tampa Bay Lightning regular-season practice. Winners are chosen based on the photo’s creativity and the quality. Get involved by sharing your photo and using #HondaFanSalute #WildeHonda! Check out HondaFanSalute.com to see past submissions.